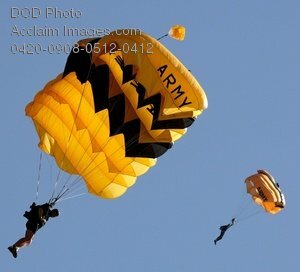 Description: Free, public domain image: Army Golden Knights Parachute Team Members Landing. Two U.S. Army Soldiers from the Golden Knights Parachute Team come down underneath their parachute canopy in preparation for the accuracy competition at the 4th Conseil Internationale du Sport Militaireís (CISM) Military World Games in Hyderabad, India, Oct. 14, 2007. The CISM Military World Games is the largest international military Olympic-style event in the world. (U.S. Air Force photo by Master Sgt. Glenda S. Lynchard) (Released.